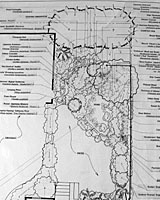 A completed design, at right, will show the specific location of all existing, transplanted and new plant materials at their mature diameter to illustrate how they'll fit together over time. Plants will also be labeled with both their common and scientific name to avoid any confusion when garden center staff or landscape contractors bid on the installation of a design. And, along the right side of each design you'll find a detailed plant material list indicating the total number of each plant in the design, their mature size, ornamental features and specific instructions for their care (e.g., when to prune, cut back, divide, etc.). 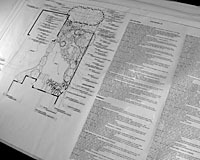 Your design will also show the location, dimensions and/or specifications of all "hardscape" features including sidewalks, patios, decks, retaining walls, ponds, fences, etc., at left. Speaking of bringing a project to life, click on the "Design Implementation" link at right to see how we can do just that.